In the rest of this article we’ll go through each of the above points individually but would advise that you follow up with your own research too. A loft conversion typically costs between £21,000 – £44,000. You could pay up to £63,000 if you want a particularly large extension. The biggest factors that affect price are the size of the extension, your location, and the number of dormers. The type of loft conversion you settle on can depend on many things; the most important being how much you want to spend. Then there’s the very real question of whether or not the space is suitable (ie what type of roof you have and whether there’s enough room for what you want) and thirdly, if you’re likely to get any necessary planning permission. Velux – the least expensive option involves affixing one or two windows to the roof in order to introduce light. Cost: £21,000-£41,000. Dormer – the most common type of loft extension in the UK today, the Dormer is a small flat roofed extension with a window. It’s common to have two of these on the one roof for the sake of symmetry. But side dormers and even L-shaped Dormers (where an extension is added to the rear of the Dormer) are possible too. In the case of the latter it could result in up to four new rooms. Cost: from £31,000-£58,000 for a standard Dormer and £40,000-£60,000 for an L-shaped Dormer. Hip to Gable – this is whether either one of both of the end sloping parts of the roof are replaced with a gable wall. Cost: £42.000-£65,000. Mansard – the most extensive option, a Mansard extension means replacing one whole side of the roof to form a straight wall and flat roof. It could mean extending both sides, resulting in a whole new storey. The renovation is major and would involve planning permission (more later). Cost: £45,000-£75,000. Builder – to construct those walls in the first place and find out what is structurally possible. You’ll also need insulation and sound proofing. Ask what type of insurance s/he has. Glazier – to deem what type of windows are best. Electrician – there’s no question you’ll need lighting, as well as sockets for electrical equipment (especially if you plan on turning the space into an office). Is this tradesman qualified and listed on the government’s Registered Competent Person Scheme? Can he give you a BS7671 test certificate once he’s finished to allow you to pass Building Regulations? Heating engineer – thanks to the awful British weather, heating is a must. This engineer should be able to tell you the best place to put a heater. Also, if you’re going for a big extension, would it be an idea to fit solar panels? Again, you’ll want him or her to be registered with APHE or similar. Plumber – you may want an en-suite if you’re planning to make the conversion an additional bedroom. Joiner – you will probably need new ceiling joists since there’s going to be a lot more traffic. You might also want to ask your joiner about bespoke storage solutions (loft conversations can be an awkward shape and you’ll want to maximise space). Plasterer – to smoothen out the new walls. Scaffolder – if you’re going for the larger extensions such as Hip to Gable and Mansard then you’re going to need temporary roof support. Painter – unless you plan on doing a bit of DIY decor, that is. How long your conversion will take to complete depends, of course, on what type you plan on getting in the first place. The Mansard, for instance, is the largest and can take up to two months from start to finish. With a Dormer you’re looking at a timescale of from four to six weeks while a double Velux should take around a month. Again, whether or not you need your local authority go-ahead depends on the type of conversion and the status of your home (if it’s listed then you’ll definitely need to inform the planning department of any intended alterations). If the loft conversion is higher than the original roof or going to affect the view for others (as in the case of the Mansard) then neighbours are informed by your local planning authority and given 21 days in which to lodge an objection. 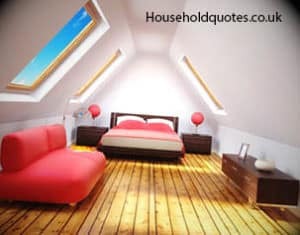 Get Your FREE Loft Conversion Quotes NOW!